While I spent most of my teen years in the Pacific Northwest, my only real foray into British Columbia was up to Vancouver, Victoria and Whistler a few times. This time, I got to go a little further north. 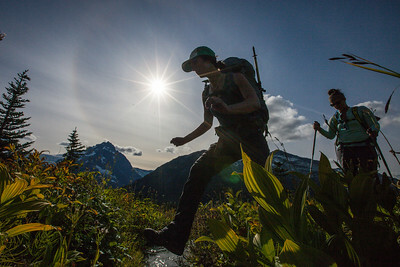 About half way between Washington State and Alaska lies the beautiful Bella Coola Valley. It’s at the end of a 70-mile fjord and the mountains continue to climb from there. Our adventure started on the Atnarko River, a tributary of the Bella Coola River, in the hopes of spotting some bears out fattening up on the salmon coming up river looking to spawn. It was cool in the shade but warmed nicely once we got into the sunshine. The water was beautiful and clear but frigid. It was coming right from the snowfields still melting away on the mountain peaks above. It was a very gentle float through an intimate passageway of wandering water. 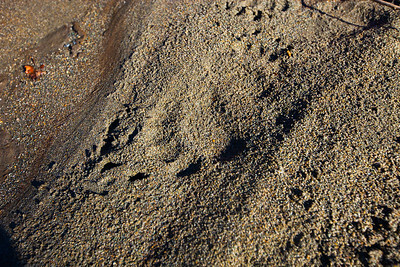 We stopped at one sandbar where mamma and cub bear tracks circled around each other but yet, no bears to be seen. At another stop another river flowed in, starkly contrasted from the crystal clear Atnarko. This little tributary was milky with suspended glacial till. Yet, still no bears. We pulled our rafts out and had lunch then shuttled them further down stream to the Bella Coola River itself. Like that small side stream, the Bella Coola was milky white, chalk full of glacial runoff. Wide and gentle, we floated casually and could now see the mountain peaks past the canopy of trees. Still, no bears. The next morning we drove back to the small airport we flew into. Except this time, we went past the tiny commercial flight terminal to a small hanger where a sleek Eurocopter sat out glistening in the sun. Our group loaded in stages up to a ridgeline high above the valley where we were left to explore the upper reaches without first having to hump our way up there. It probably wasn’t impossible to do in a day, but it would have made for a very long day without the help of the helicopter. We traveled casually along the southern spine of Goat Mountain (as it’s known by the locals on the map it’s Latin Peak) to the summit. One of the glacial ponds along the way lured Billy to jump in and above that patches of snow were sculpted by the melt of the sun and the driving wind. Some of these were big enough to possibly last until winter set back in. From the rocky summit we could see the arm of the fjord reach in and then we continued down the northwest ridge until it was time to call it a day and the helicopter popped up and picked us up. Instead of going right back to the airport, we first got a tour of some of the glaciers on the ridge across the valley from where we had been hiking. Still, no bears. 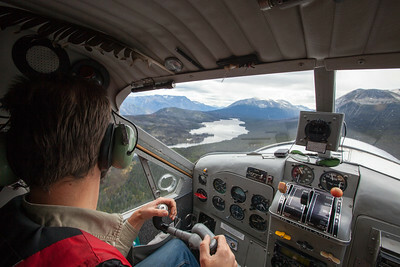 On day three we drove up and out of the valley to Nimpo Lake where we boarded a DeHavilland Beaver on floats to fly us to Turner Lake. We flew past the appropriately named Rainbow Mountains then past Hunlen Falls to get a great view of both from the air. Once we landed we wandered over to a great view point of Hunlen Falls and could take some time to appreciate its 1,316-foot plunge down the chasmy grey cliff face. The afternoon was spent just chilling out at a wooded camp along the lake waiting for the aircraft to return to pick us up. Again, we got another sceenic tour of some of the incredible landscape including a glimpse of the massive Monarch Glacier. For our last two days we saddled up and earned our views by hiking up from the valley towards Polar Bear Peak. Hiking through the rain forest is always an experience. The trail got steeper and then we broke away from the trees and onto the mountain meadows where the bugs were waiting for us. After pumping some water, we hauled it up to a ridgeline with a view of Iroquois Peak in the hopes a bit more wind would ward off the flying pests. No such luck. Still, this is where we wanted to camp so we hunkered down. Some took refuge in their tents but left the rain fly off so they could see out the mesh. Others braved the biting and pestering bugs by wrapping scarves and whatever else they had around faces and really, any exposed skin. Once the fire was lit and the sun set, the bugs disappeared and we could gather and chat and enjoy the night until the cold and effort of the hike drove us to bed. The next morning the sun graced those white peaks across the valley and the bugs were back. Instead of the quick boil-based breakfast we had planned, we packed it all up and survived on bars to get us down the hill. We thought for sure we’d see some bears on this trip, even though we were well above the salmon filled rivers where we had first looked for them along the Atnarko river. The saying went “There’re no bears in BC”. That could mean Bella Coola or the more daunting scale of British Columbia. We knew that wasn’t true. We also knew we were on the early end of the season. It just leaves a convenient excuse to have to go back. This entry is filed under: Air, Blog, Earth, Hike, North America, Photography, Raft, Story, Water. Great blogging. Made me want to be there with you…..except for those little critters flying around!